Basic homeowners policies cover damage due to fire. Insurance is designed to protect you against financial loss if you experience a covered event. There are a plethora of different kinds of insurance that cover everything from your life to your property. Homeowners insurance is a hybrid type of policy that covers you against the physical loss of your possessions and provides liability protection if someone is injured on your property. The type and amount of coverage you have depends on the terms of your policy. There is no law that requires you to purchase or maintain homeowners insurance. That being said, if you took out a mortgage to buy your home, your lender might require you to carry specific levels of homeowners insurance to protect the lender's investment. Once you've paid off your mortgage you can cancel your policy if you wish, but since your home is likely your largest single investment, maintaining your homeowners policy might be a desirable option. Basic homeowners insurance policies cover both the physical structure of your home and your personal possessions. They also provide liability coverage to defend you in court if you are sued for property damage or personal injury caused by you, members of your family or even by your pets. The liability coverage typically includes a minimal amount of no-fault medical coverage. For example, if your dog bites a neighbor's child, your homeowners policy will pay for the medical treatment to patch him up. Your homeowners insurance policy is quite specific about the kinds of events it will cover. These events will be listed in your policy, including any limitations. 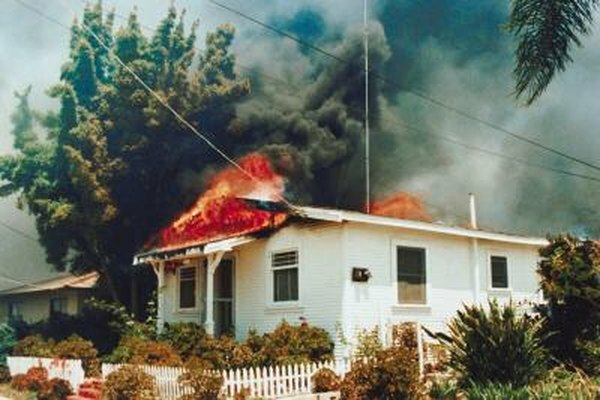 All types of homeowners policies cover your dwelling and personal property against loss due to fire, lightning strikes, windstorms, hail, explosions, damage from aircraft or motor vehicles, vandalism, civil commotion, theft, smoke and volcanic eruptions. The extent of coverage will be affected by the amount of your deductible and the maximum limits on your policy. Your coverage might be limited to your property's depreciated value or replacement value, depending on the provisions of your policy. Homeowners insurance policies typically cover water damage that results from a covered event, but no homeowners policy includes flood damage as a covered event. Flood insurance is available as a separate policy from the National Flood Insurance Program, and some insurers offer flood coverage as a policy rider. Homeowners insurance typically doesn't cover damage caused by earthquakes, sewer backup, termites or vermin. Your homeowners policy usually won't cover an event that is caused by or exacerbated by lack of proper maintenance. Insurance Information Institute: What is Homeowners Insurance? Insurance Information Institute: Can I Own A Home Without Homeowners Insurance?